Transport has played a major role in shaping the spatial configuration of the city-region. Demands for reliable, efficient, and tourist-friendly public transport has resulted in the construction of large-scale public transport interventions such as the Gautrain, and Johannesburg and Tshwane’s respective Bus Rapid Transit (BRT) networks. The GCR has witnessed a dramatic shift in travel modes over the past decades*. The 1975 Transvaal Provincial Administration Roads Department (PWV) transport study recorded a dominance of buses and trains as the primary form of transport amongst the black African population, with private cars as the main mode for the White population. In contrast, the latest 2011 transport modes for all races show that cars (33 % of trips) and taxis (50% of trips) are now the dominate mode of transport. Buses and trains account for less than 8% of all trips. However this sector should play a more significant role in the next few years with significant public investments in the overhaul of rail infrastructure and rolling stock and the introduction of BRT services in the Gauteng Metros. 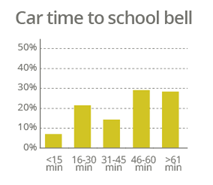 Transport conditions require many children to leave home very early to get to school on time. 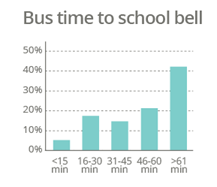 A bus (42%) is the most frequent mode of transport used by children who leave home more than an hour before the school bell. This is followed by taxis (39%) and cars (29%). 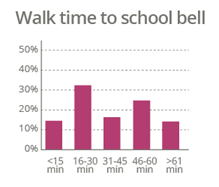 Children who walk to school are the best off: only 14% leave home more than an hour before the bell. 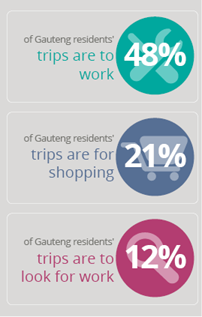 The main 'most frequent' trip (made by the respondents that travel) were to work (48%), followed by shopping (21%) and looking for work (12%). The main mode for school trips is walking (51%) followed by the car/motorbike (19%), taxi (15%) and school bus (8%) accounting for the next important modes. Only 2% of children use bicycles. 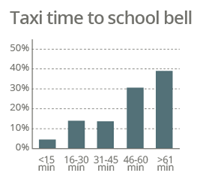 The most frequent modes of transport used by children who leave home more than an hour before the school bell are bus (42%), taxi (39%) and car (29%).